After viewing the shocking photos of the little Syrian boy washed up on a Turkish beach in the fall of 2015, the global plight of refugees was brought to the forefront of public consciousness. Since that time, many people have expressed a sincere interest in knowing exactly how to Privately Sponsor a Refugee to come to Canada. In this episode, I had the opportunity to catch up with Ronalee Carey, an Immigration Lawyer practicing in Ottawa, who was able to share some unique insight into this process. She definitely inspired me to become more involved. Ronalee’s practice focuses on finding immigration solutions for individuals and families through family sponsorships, the Express Entry program and provincial nomination programs. She assists with visa applications to visit, study or work in Canada, and helps those with criminal inadmissibility issues. In addition to her private practice, Ronalee is also a Refugee lawyer. She is part of a group in Ottawa that provides pro bono services regarding the Private Sponsorship of Refugees. When I learned of her involvement with Refugee work, I thought it would be a great topic for our Canadian Immigration Podcast. If you are someone who is interested in knowing how the process works, this episode will point you in the right direction. After listening to Ronalee explain the refugee sponsorship process in great detail, I came to the realization that this is something that any of us could consider doing in our own communities. Her passion for this area and sincere desire to help those less fortunate than us in Canada, really struck a cord with me. It was an absolute pleasure having her on the Podcast. How Ronalee got into the immigration field. Her involvement in Private Refugee Sponsorship Work. What is the University of Ottawa’s Refugee Sponsorship Support Program? How did she get matched to the G30+ Ottawa constituent group? How does the group go about finding refugees to sponsor and their experiences in settling the refugees who have arrived in Canada. Discussion on the Government of Canada partnering with Canadians to jointly assist refugees through the Blended Visa-Office Referred (BVOR) program. How has the government has handled the sponsorship of refugees so far and what the future holds for the private sponsorship of refugees in Canada. How to go about sponsoring a refugee from Syria or elsewhere. 02:15 – Who is Ronalee Carey? 04:00 – How she got into the immigration field? 06:55 – How did she get involved in private refugee sponsorship work? 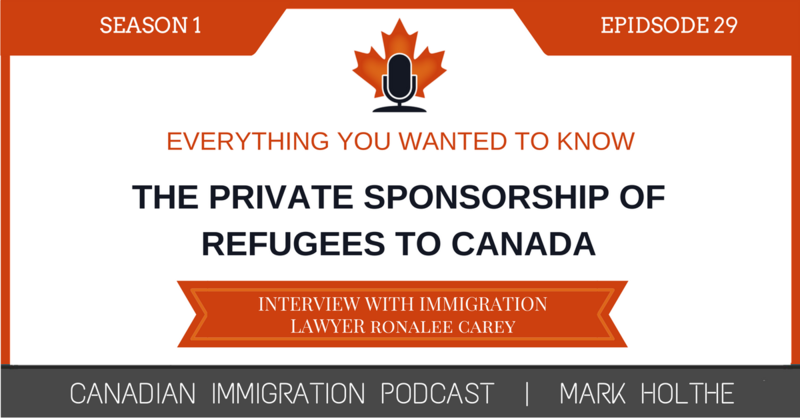 07:34 – How the process works when Privately Sponsoring Refugees to Canada. 08:03 – Who screens the Refugee before they come to Canada? 09:25 – What is the uOttawa Refugee Sponsorship Support Program (RSSP)? 18:29 – How did Ronalee get matched to the G30+ Ottawa constituent group? 18:59 – How did the group link up with the Anglican Diocese? 21:45 – How did the group go about finding refugees to sponsor? 23:40 – Who has the group sponsored so far? 28:45 – What are the qualifications to become a Sponsor and the obligations towards the Blended Visa-Office Referred (BVOR) candidates that are selected? 32:00 – How has the private sponsorship process worked out for her group? 34:00 – How is the government handling the sponsorship of refugees, now that the initial election promise to bring in 25,000 Syrian refugees has been fulfilled? 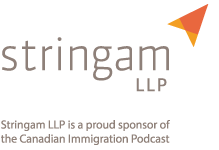 35:48 – Is there still a strong interest from the Canadian public to sponsor refugees? How has the government responded to the significant interest generated in the private refugee sponsorship programs? 41:07 – If someone was interested in sponsoring a refugee, from Syria or elsewhere, how would they go about it? 45:38 – How to contact Ronalee Carey. Bio – Ronalee Carey is an immigration and refugee lawyer who practices in the beautiful capital of Canada – Ottawa, Ontario. 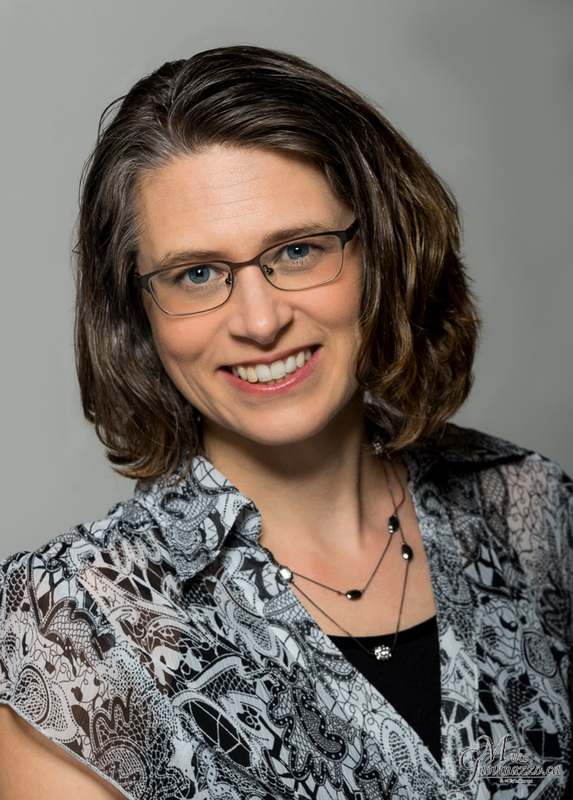 Her practice focuses on finding immigration solutions for individuals and families through family sponsorships, the Express Entry program and provincial nomination programs. She assists with visa applications to visit, study or work in Canada, and helps those with criminal inadmissibility issues. Part of Ronalee’s practice includes refugee work. 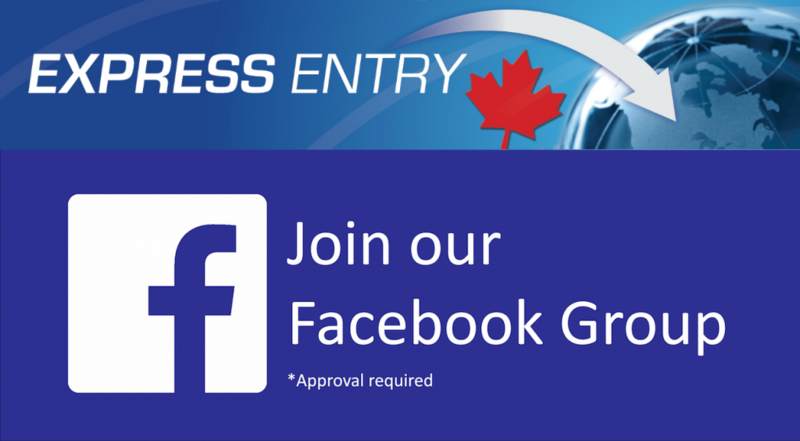 She assists individuals who have arrived in Canada who wish to claim refugee status. She also provides pro bono assistance to a group in Ottawa who are privately sponsoring refugees from abroad. Question: How did you find yourself in the immigration field? Since I was a young child, I knew I wanted to be a lawyer, but immigration law was never something I’d thought about. I grew up in a small town in northern Ontario were we had a total of 7 racialized individuals in the entire town, one of whom was my fifth grade teacher. When I went to law school, I focused on criminal and family law. I articled at a general practice firm, and after my call to the bar, practiced mostly family law. My life then took a huge turn. My husband and I had been foster parents for the Ottawa Children’s Aid Society for several years, and we had the opportunity to adopt a beautiful baby girl through the society. She was mixed race, with an East Indian birth mother and a birth father of African descent. We later adopted two additional children, both of Haitian descent. I took an extended leave from my career during this time. When I was ready to return to the practice of law, I wanted to start back part-time. I ran into a former classmate at a Law Society event, who had an opening for a legal researcher/law clerk with part-time hours. Her field happened to be immigration law. When I started working in immigration law, I was immediately hooked. I was able to meet people from all over the world, and every matter provided a new and interesting challenge to solve. I loved how political immigration law was; I could read an article in my morning newspaper that would affect how I would handle a client file that day. In 2012 the lawyer I had been working for moved from Ottawa in order to be closer to her aging parents. She left me a few files, and I ‘hung up a shingle’. Recently, I had to hire a junior lawyer to assist me with files. Question: How did you get involved in private refugee sponsorship work? Like many people in Canada, I was devastated at seeing the photo of Alan Kurdi’s body washed up on the shores of a beach in Turkey. In September, 2015, I received an email from the University of Ottawa’s Refugee Hub, which called for lawyers willing to volunteer with a new initiative designed to assist individuals and groups who wanted to sponsor Syrian refugees to come to Canada. I immediately signed on. From that initial email, grass roots organization continued, and volunteers in Ottawa put together the Refugee Sponsorship Support Program. The goal was to match volunteer lawyers with groups and individuals who wanted to sponsor Syrian refugees. Not all the lawyers were immigration and refugee lawyers – in fact the majority were not. As such, training had to be provided. Even for me, the procedures were new – though I’d assisted with inland claims for refugee protection, the overseas process was new to me as it was to many private immigration lawyers. We met in a room at City Hall for the training. A generous lawyer from our local bar bought pizza for the hundred or so attendees. Our next step was to reach out to the community, to let them know our services were available. The City of Ottawa was planning a community information night, to let interested sponsors know about the process and to allow local immigrant service agencies provide information on their services. Another grassroots organization called Refugee 613 had emerged, to connect people in Ottawa who wanted to donate money, volunteer or sponsors refugees with others. Refugee 613 was a big presence at the event. The event was overwhelmingly successful. Hundreds and hundreds of people from Ottawa showed up to the event. The information session itself was supposed to be held in the municipal council chambers, but it filled to overcapacity and the speakers had to be broadcast into the atrium for those who couldn’t get into the room. Even the atrium was overflowing. The uOttawa RRSP had set up a free legal clinic, so that potential sponsors who speak to a lawyer at the event about the procedures for sponsoring. We gave legal advice to over 400 people that night. Question: How did you get matched to the G30+ Ottawa constituent group? The goal of that first evening, at Ottawa City Hall, was to provide initial legal advice to as many people as possible who wanted to sponsor Syrian refugees. Later, the goal was to match those individuals or groups who wanted to proceed with a lawyer willing to help them through the process. At the legal clinic, the first group of people I gave advice to was another lawyer who worked for the Federal government. She and two friends had both committed to finding 10 people each, all willing to donate $1,000. The money raised by these 30 people would allow them to sponsor a family from Syria. I requested to be ‘matched’ to this group, so that I could be the pro bono lawyer for the group and help them with the sponsorship process. In addition, my husband and I requested to become members of the group of 30, and made a personal financial contribution. As such, I am not only the pro bono lawyer for the group, but also a group member. Question: How did this group of 3 turn into the G30+ constituent group? The three initial group members intended to do a Group of 5 (G5) sponsorship. This is a special program where 5 individuals agree to provide financial and settlement support to an individual or family. The plan was to find two other people who could join them in the Group of 5, as official sponsors, and the other individuals would provide a supporting role and assist in the financial aspect. The core three members were overwhelmingly successful in their efforts to find others willing to join them in sponsoring a Syrian family. They quickly found more than 30 people willing to help, which is why the name had to become the G30+. Their fundraising efforts were also much more successful than they’d originally hoped for. Our initial meeting of the group saw funds pledged in excess of $70,000. This meant the group could sponsor more than one family. Question: How did the group link up with the Anglican Diocese? Because the group had become so large, and had raised so much money, a Group of 5 sponsorship wasn’t really appropriate anymore. We needed a larger focus. In Canada, the government has partnered with groups called Sponsorship Agreement Holders (SAH), who are pre-approved to sponsor refugees. Many of these SAHs are religious groups. In Ottawa, the Anglican Diocese has a great deal of experience with refugee sponsorships. They agreed to take on the G30+ Ottawa group as a constituent group under their organization. This meant that funds raised could be channelled through the Diocese’s charitable structure, which allowed members to receive tax receipts for their contributions. We also were able to tap into the Diocese’s wealth of experience in making applications to sponsor refugees. Question: How did the group go about finding refugees to sponsor? The group had a very unusual problem. We had lots of money, lots of volunteers including Arabic speakers, and no one to sponsor. No one from our group was Syrian, so there were no family members we could help. At the time, neither the Canadian government, Refugee 613, nor the uOttawa RSSP was able to match potential sponsors with either family members in Canada or directly with refugees overseas. So, we had to look abroad ourselves. One of our group members had connections to a group of women who were Nobel laureates. This group directed her to a journalist working in a Syrian refugee camp in the Zaatari, Jordan. She further spoke to a translator she worked with, to ask him if he could identify anyone who the group could sponsor to come to Canada. The translators’ brother was interested. Prior to the war he’d studied business in university, and he was desperate to get to Canada. He would act as an ‘anchor relative’, to later assist his parents, and his siblings and their families to come to Canada. The translator also identified a family who needed our help. Both parents had worked in leadership roles in the camp, the father as a team leader and the mother as part of a health committee. They had six children ranging in age from six months to 17. We agreed to take on both the single individual and this family of 8. Working through the translator, we have completed the sponsorship applications for these 9 individuals. We have provided the applications to the Anglican Diocese, who is preparing them to submit to the government. However, they have to wait until the government opens up spaces in the queue. Question: Who has the group sponsored so far? While efforts were underway to sponsor these 9 individuals, another opportunity presented itself. The government of Canada, in addition to directly sponsoring individuals through the Government Assisted Refugee (GAR) program, partners with Canadians to jointly assist refugees through the Blended Visa-Office Referred (BVOR). In this program, refugees who have been identified by the UNHCR are referred by Canadian visa offices oversees. The government puts these individuals and families onto a list, and SAHs are able to offer to sponsor the individuals. The government provides for 50% of the financial cost of the sponsorship, and the SAH (or their constituent group) provides the remainder of the funds. From a pro bono lawyer’s perspective, this type of sponsorship is great because the refugees have already been pre-approved – there is no need for us to complete the forms needed for the refugees, and we do not have to have any of their documents translated. All we do is submit an undertaking to provide for the family and a settlement plan stating how we will provide for the family’s needs when they arrive in Canada. For sponsorship groups, getting a BVOR family is like winning the lottery. The list of eligible families is sent out by the government. Only a bit of information is provided – names, ages, occupations, where they’d like to live in Canada. 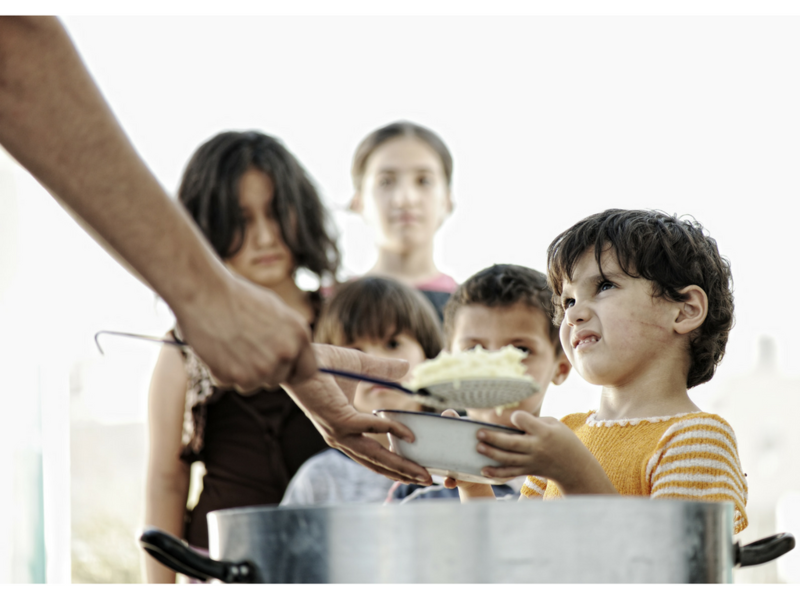 Sponsors have only a few minutes to choose a family and respond – there is so much interest that any hesitation means all the refugees will be claimed by sponsoring groups. The G30+ Ottawa group was fortunate to be matched with a family of 4 from Syria, parents and two young children. This family arrived in Canada this past February. In addition, we were contacted by the Anglican Diocese to sponsor a woman whose son was already in Ottawa as a refugee. Though the woman is Iranian, not Syrian, the group agreed to sponsor her. We are hoping she will arrive shortly. Question: What have their experiences been to date, in settling the individuals who have arrived in Canada? We are blessed with many capable volunteers. An affordable apartment was found for them; it was furnished mostly by donations. After they arrived, they were set up in school and language classes, and things like health cards were applied for. For the summer, day camps were found for the children. We’ve had a potluck dinner to welcome them. It has been a wind whirl of activity. Because the family did not speak English when they arrived, a lot of the work fell onto the Arabic speaking members. Question: How is the government handling the sponsorship of refugees, now that the initial election promise to bring in 25,000 Syrian refugees has been fulfilled? The government reached its target of 25,000 Syrian refugees in February, 2016. This 25,000 was made up of both government and privately sponsored refugees, including our family of 4. However, they also promised to bring in a total 25,000 government assisted refugees by the end of 2016. They appear on track to fulfil this commitment. You may remember at our national immigration law conference in April, our immigration minister appeared for a luncheon address. He said that he was probably the only immigration minister in the world being criticized for his failure not to provide enough refugees for those interested in sponsoring. However, he stated that the government’s target of a maximum 300,000 immigrants for 2016 was firm, and that he would not be increasing that number in order to accommodate more refugees. Question: Is there still a strong interest from the Canadian public to sponsor refugees? How is the government responded to the interest in the private refugee sponsorship program? I spoke to Don Smith, from the Archdiocese of Ottawa about the problem of there being more interest from the Canadian public to sponsor than our government is willing to provide capacity for. He told me he was torn over the issue. He said on the one hand, we don’t want to allow our government to back away from the UNHRC and the international community by failing to take in its share of refugees. On the other hand, there are so many people who have family they want to sponsor, and other individuals who want to help settle refugees in Canada, that restructuring the way refugees spaces are allocated might be the only short-term solution. That means less government assisted refugees, and more BVOR spaces along with priority processing to G5 and other privately sponsored refugee programs. And the evidence seems to be mounting that privately sponsored refugees do better than government assisted refugees. Our own refugee family is a case in point. They arrived in Canada to a 30+ new friends, willing and able to help them with anything they could possibly need. Shortly after our family arrived, the parents of the father of our family (the children’s grandparents) arrived as government sponsored refugees. Though our group has provided some settlement assistance to them as well, they don’t understand why they don’t have their own group to help them. Question: If someone was interested in sponsoring a refugee, from Syria or elsewhere, how would they go about it? A minimum group of 5 individuals is necessary in order to be able to sponsor. Partnering with a SAH is not necessary, but provides numerous benefits. There are also community sponsorship programs, and a program for people willing to sponsor refugees with high needs, such as those with medical conditions or who have experienced severe trauma. But individuals and groups need to temper their expectations. I attended a session where Louisa Taylor of Refugee 613 spoke. She made the very poignant comment that ‘refugees are not pets’. These are individuals with their own personalities and temperaments, who may or may not want to accept the friendship and help you are offering when they arrive in Canada. We think that when refugees arrive in Canada, they will jump at every opportunity to learn English, find a job, and integrate into the community. But what if they are so exhausted by their ordeal they have been through that they only want to watch Arabic television? And what if the group wants to sponsor, has the funds, but there are no spaces left in the government programs? Some people will need to find another way to channel their goodwill.